China has successfully launched on Wednesday, Dec. 21, its first mission dedicated to carbon dioxide detection and monitoring. 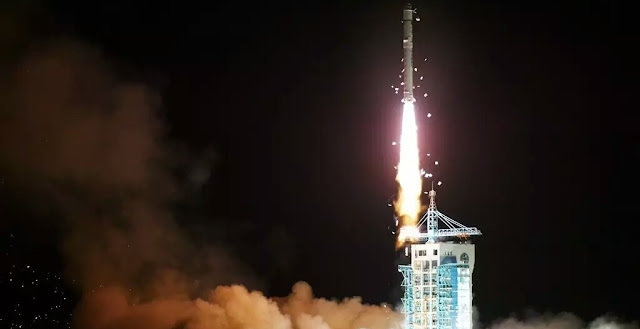 The spacecraft, named TanSat (“Tan” means carbon in Chinese) lifted off atop a Long March 2D booster at 19:22 GMT from the Launch Area 4 at the Jiuquan Satellite Launch Centre, located in the Gobi desert, Inner Mongolia. The TanSat project was initiated in early 2011, targeting the end of 2015 as the original launch date. In March 2013, the Preliminary Design Review (PDR) of the mission was completed and the engineers began the electromechanical integration of particular parts of the satellite in mid-2014. By the end of 2014, the spacecraft has passed the most important milestone during the phase of its development – the Critical Design Review (CDR). With the major milestone completed, TanSat was ready for the last crucial inspection – the Satellite Readiness Review (SRR) before the mission could enter the final phase of pre-launch preparations. SRR was conducted in April, 2016 and at that time the launch was scheduled for June 2016. However the liftoff was soon postponed to August 2016 and finally to Dec. 19. Chinese officials has not revealed what was behind the series of delays. The mission entered the final stage of preparations in mid-November with the arrival of the Long March 2D rocket at Jiuquan. Last pre-launch activities included integration of the spacecraft with the launch vehicle, propellant filling operations and final checkouts of electrical systems. After liftoff on Wednesday, the Long March 2D rocket completed a short 10-minute ride into orbit, releasing the satellite into space. During the first phase of the flight, the launch vehicle was powered by its first stage, making use of the YF-21C engine delivering 2,962 kN of thrust. The first stage operated for nearly three minutes until it separated from the launch vehicle. Then, the second stage, utilizing a YF-24C cluster engine, took control over the flight. It continued the mission for about seven minutes and finished its job when the spacecraft was deployed into space. Weighing around 620 kilograms, the TanSat minisatellite has dimensions of 4.92 x 5.9 x 6.07 feet (1.5 x 1.8 x 1.85 meters). It was developed by Chinese Academy of Sciences (CAS) and is based on the platform provided by the Shanghai Institute of Microsystems and Information Technology (SIMIT). The satellite features two deployable solar arrays capable of generating up to 1,790 W throughout its designed lifetime of three years. TanSat is tasked with monitoring the global distribution of atmospheric carbon dioxide, which could help reduce greenhouse gas emissions by China. The satellite is expected to improve the understanding on the carbon dioxide’s contribution to the climate change and its variation on seasonal time scales. Data acquired by the spacecraft could be essential for a wide variety of research fields ranging from oceanography to meteorology. To achieve its goals, TanSat will reside in a Sun-synchronous orbit (SSO) at an altitude of approximately 435 miles (700 kilometers), inclined 98.2 degrees. It carries two scientific instruments that will collect the necessary data: the Carbon Dioxide Spectrometer (CarbonSpec) and the Cloud and Aerosol Polarimetry Imager (CAPI). CarbonSpec is a high-resolution spectrometer for measuring the near-infrared absorption by carbon dioxide at 1.61 µm and at 2.06 µm, and the molecular oxygen A-band in reflected sunlight at 0.76 µm. CAPI is a wide field-of-view moderate resolution imaging spectrometer with polarization channels, used to compensate errors which are caused by clouds and aerosols based on observation in the following spectral bands: ultraviolet (0.38 µm), visible (0.67 µm) and near infrared (0.87, 1.375 and 1.64 µm). TanSat is part of China’s global carbon dioxide observation satellite program managed by the country’s Ministry of Science and Technology. China hopes that the spacecraft will help energy-conservation and emission-reduction efforts and support the nation's stance in international carbon dioxide emission talks. Li Jiahong, chief engineer at the National Remote Sensing Center under the Ministry of Science and Technology, said last year that China plans to use TanSat to work with other parties' satellites to form a constellation that can better detect greenhouse gases and handle climate change. The Long March 2D, used for Wednesday’s mission, is a two-stage rocket developed by the Shanghai Academy of Spaceflight Technology. It is mainly used to launch satellites to the low-Earth orbit (LEO). The 135 ft. (41.15 m) tall booster can launch payloads of up to 3.5 metric tons to LEO and has an SSO capability of up to 1.3 metric tons. The rocket was launched for the first time on Aug. 9, 1992, from the Jiuquan Satellite Launch Center orbiting the Fanhui Shei Weixing FSW-2-1 recoverable satellite. Wednesday’s flight was the 243rd flight of the Long March rocket series. It was also the ninth orbital launch from the Jiuquan Satellite launch Center in 2016 and the 21st mission conducted by China this year. China plans two or three more orbital launches till yearend. One of them is currently scheduled for Dec. 26, when a Long March 2D rocket will blast off from the Taiyuan Satellite Launch Center, carrying a duo of the country’s Superview Earth-observing spacecraft. Other launch dates for December are yet to be decided.